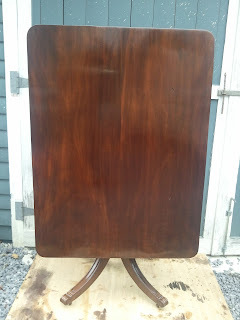 This is the second post in a series of posts I am writing concerning the restoration of the furniture from the historic Cedar Lawn Estate in Jefferson County, West Virginia. All posts concerning this furniture have the words "Cedar Lawn" in the title. 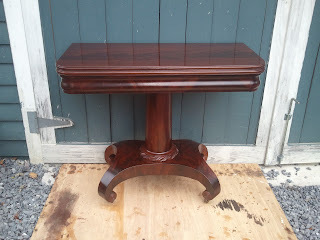 This post deals with the restoration of a Mahogany breakfast table from the English Regency period. 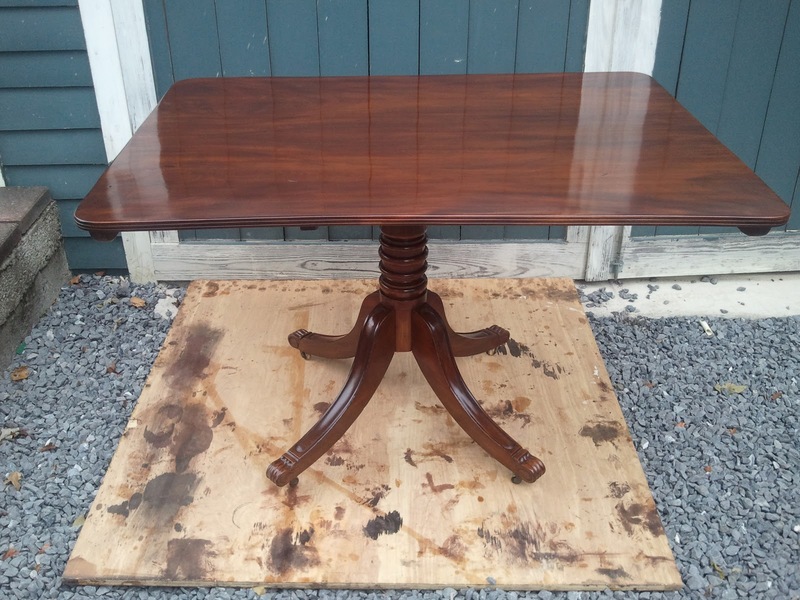 The construction of the table is circa 1820.
as the 18th century drew to a close, larger tilt top tables were introduced. 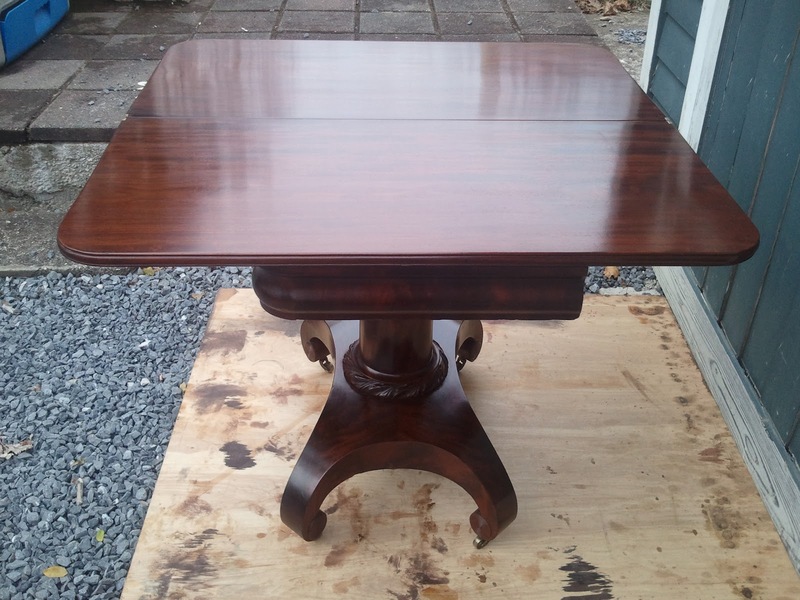 These tables served as an extra table for guests, or a smaller gathering. 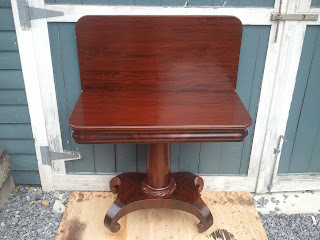 I suspect that the name "Breakfast Table" is a more modern distinction for these tables, but it is universally recognized to describe this design. Also, it does give the feeling of a more intimate use, a table to sit around the morning after entertaining, having a meal with the close friends who stayed the night. 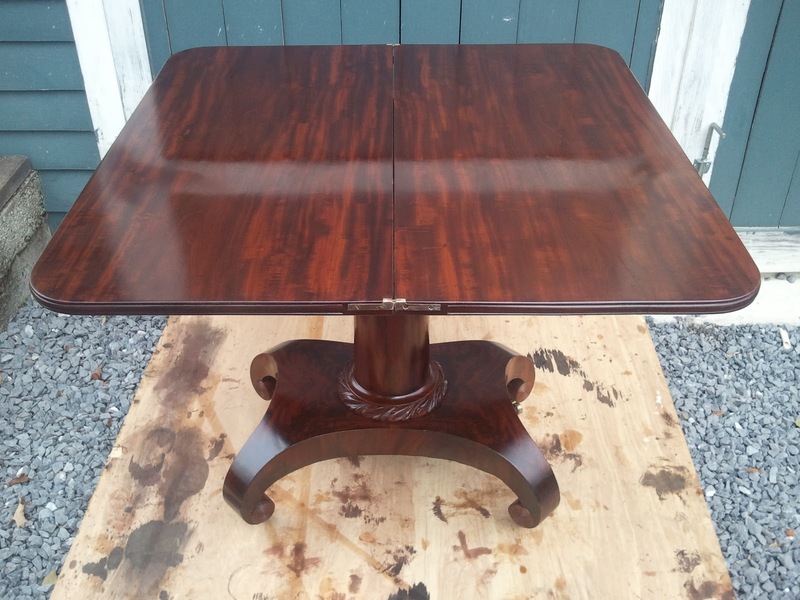 That being said, there is nothing clumsy or unrefined about the design of this table and it would give any formal dining table a run for its money. 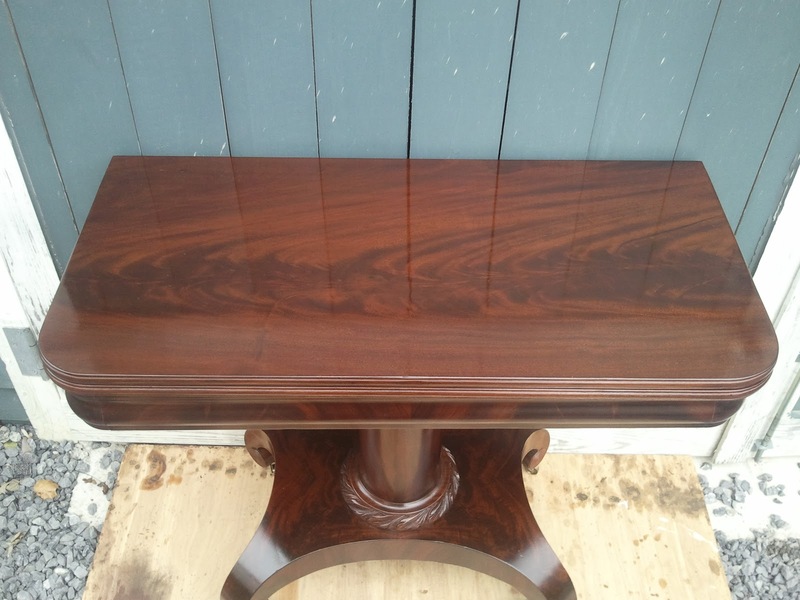 The top is constructed from two book matched boards of Cuban Mahogany. 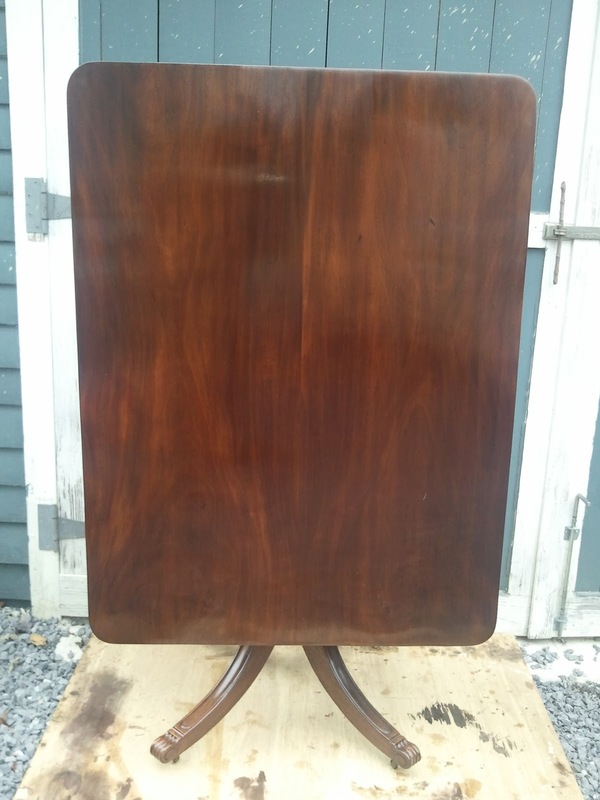 As if a surprise given to us by the cabinet maker, the opened top reveals the top of the pedestal which is a beautiful piece of figured Cuban Mahogany framed by Brazilian Rosewood veneer. Decending down the pedestal is a well turned column of Mahogany which flows into four Mahogany saber legs which terminate in a carved scroll pattern. This is a fancy table! 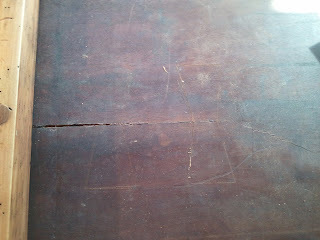 The condition of the table when I received it was pretty bad, and many years of use were evident. In addition, the tilting mechanism had been fixed by inserting four dowels through the battens under the top and into the top of the pedestal. This hid the Rosewood veneer and figured Mahogany from sight for many years. 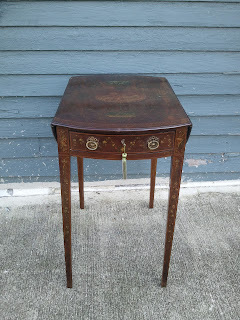 Luckily, the brass catch mechanism was still there. 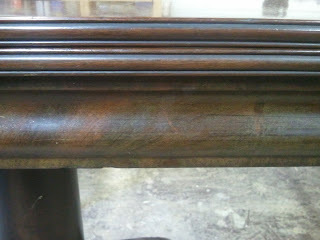 The finish was in bad shape and needed to be removed and the top had developed a crack that needed to be addressed. 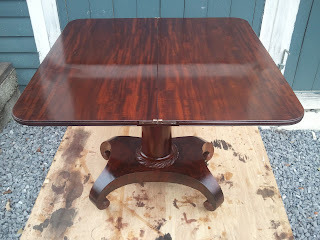 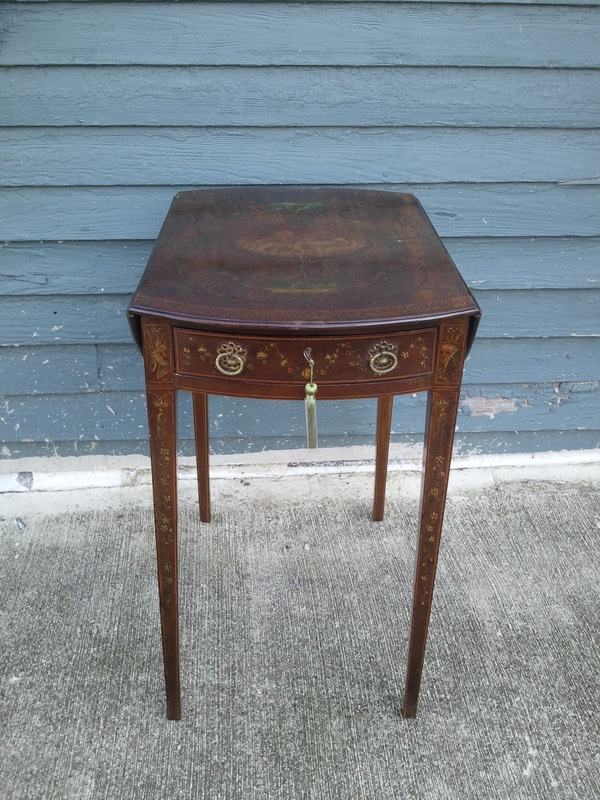 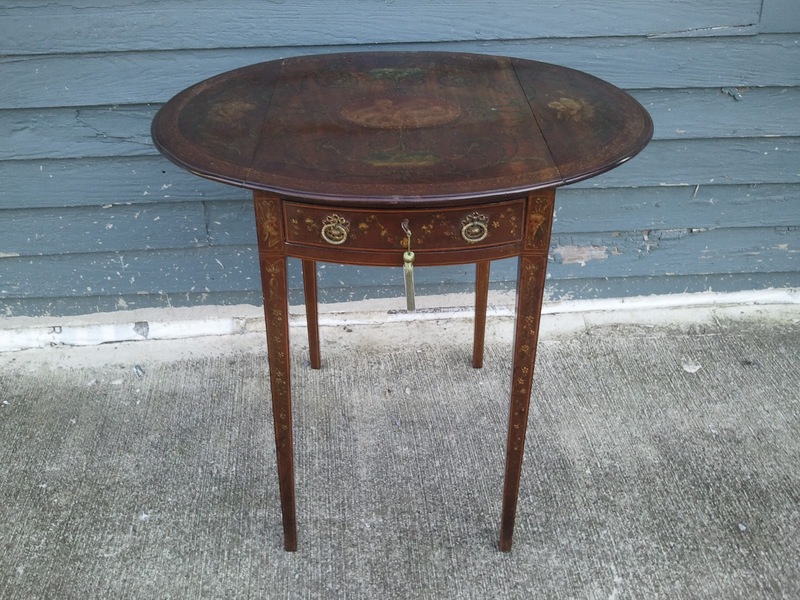 The photos below show the restoration of this beautiful table. This photo shows the table as it came to me. 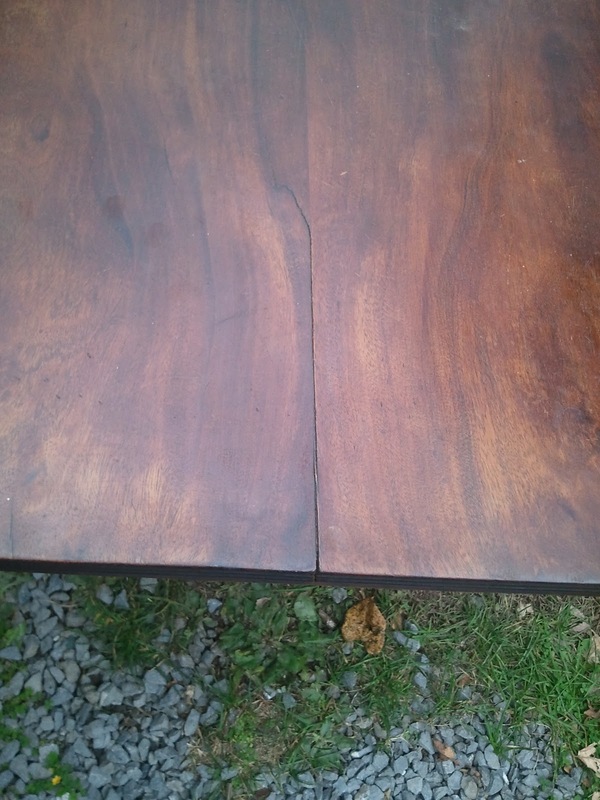 The crack in the top can be seen below. This photo details some of the damage to the finish. 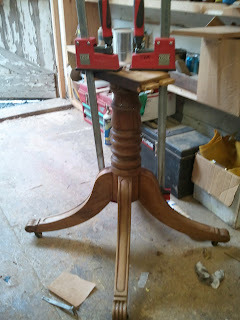 After the finish was removed, the repairs were made starting with the pedestal base. 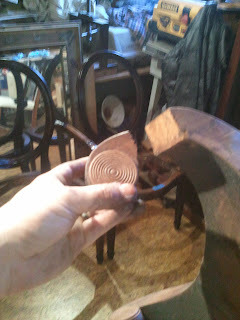 This photo shows the core stretcher of the base being wedged and glued to prevent it from wobbling. 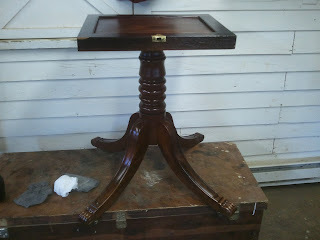 The next step was to glue the loose top of the pedestal. 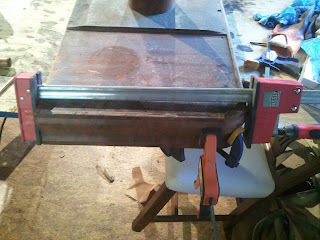 through the clamps you can see the Mahogany and Rosewood top. 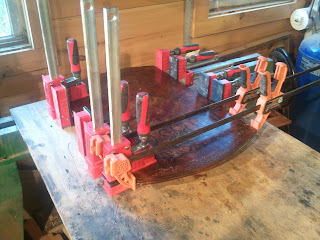 A second round of clamping followed on this section. 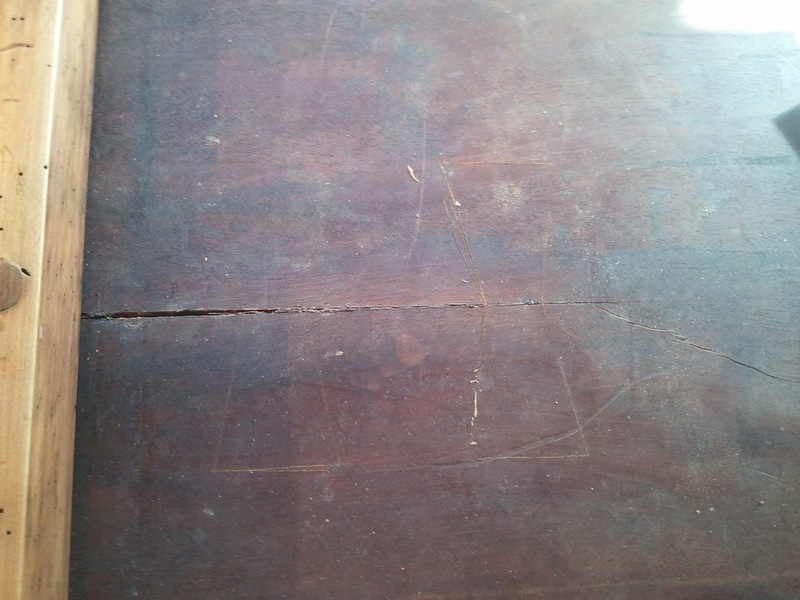 The crack in the top was addressed from the underside of the table by inserting two butterfly patches perpendicular to the direction of the grain. 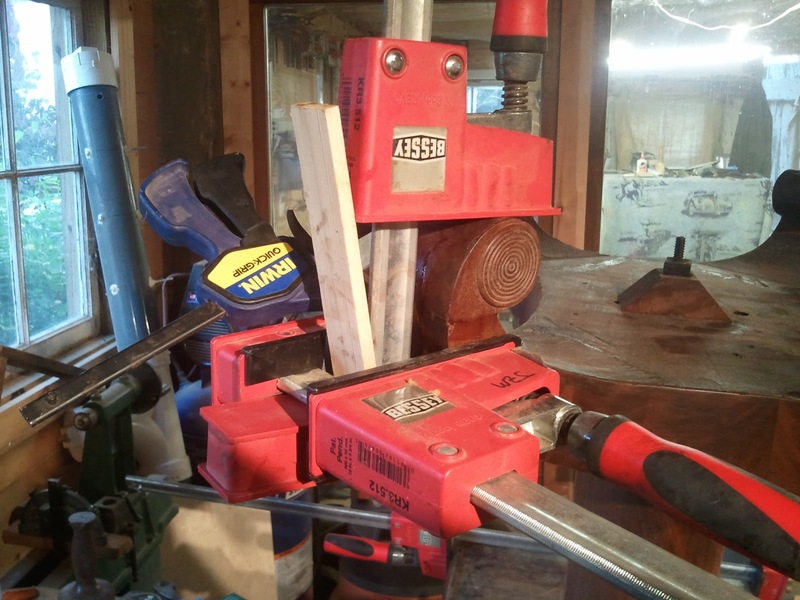 These patches keep the top from moving . 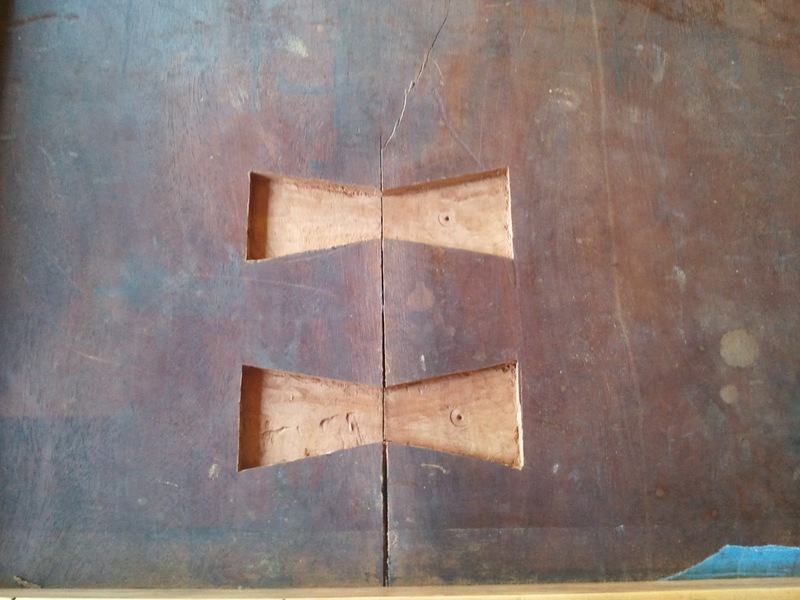 In the first photo, the patches are laid out to be scribed, The second photo shows the outlines of these patches scribed into the wood. 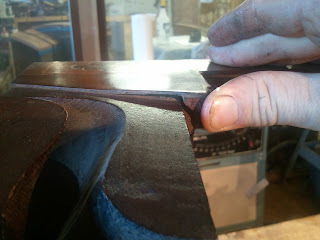 This next photo shows the mortices for the patches cut. The narrowest part of the patch is aligned with the crack in the top. 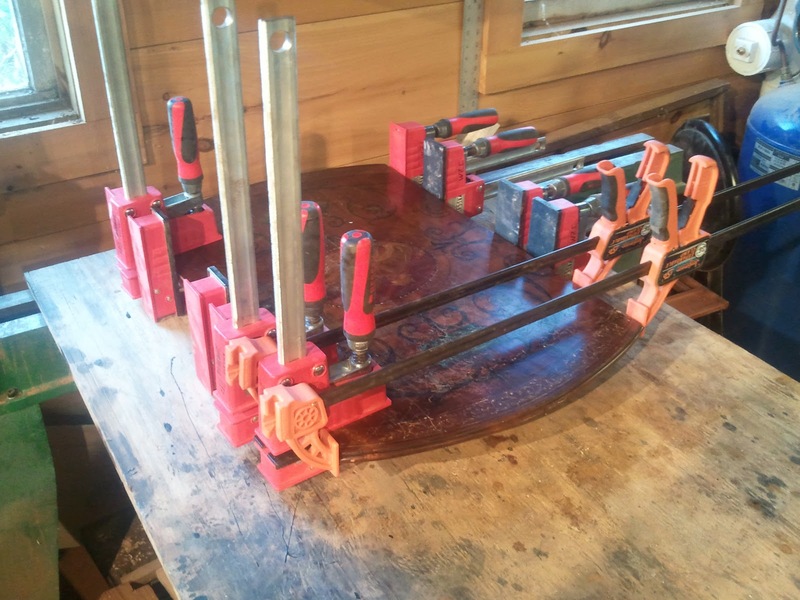 I developed a new way to clamp these patches, which uses reversed clamps strapped to the table with ratcheting tie down straps. 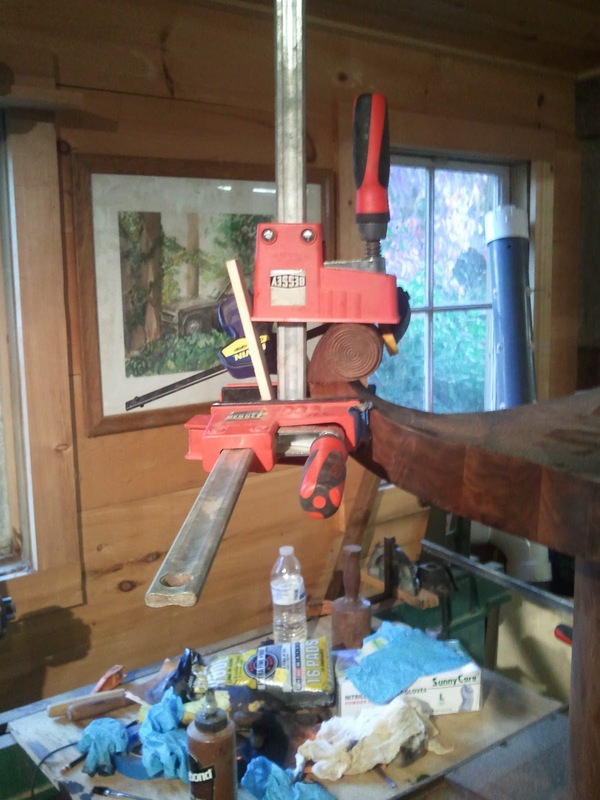 This eliminates the need for expensive deep clamps and provides a more effective pressure where it is needed. 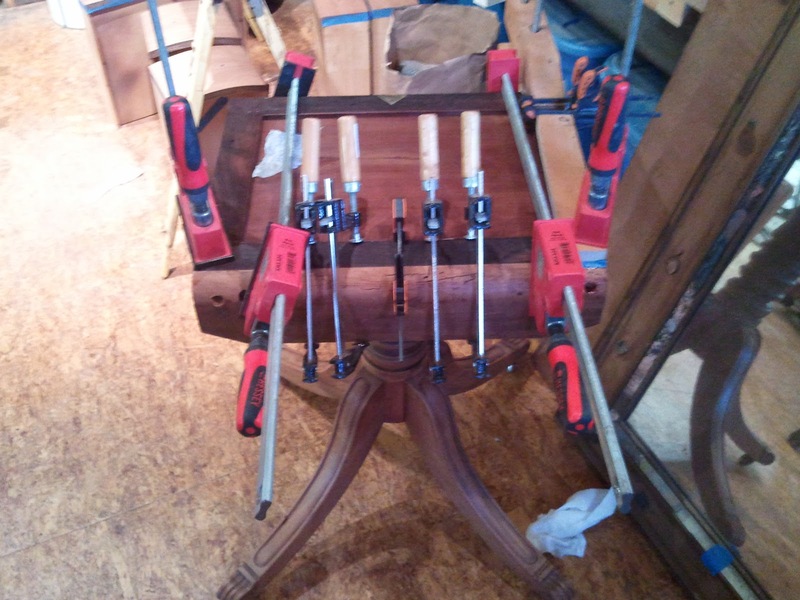 The photo below details the use of these clamps. 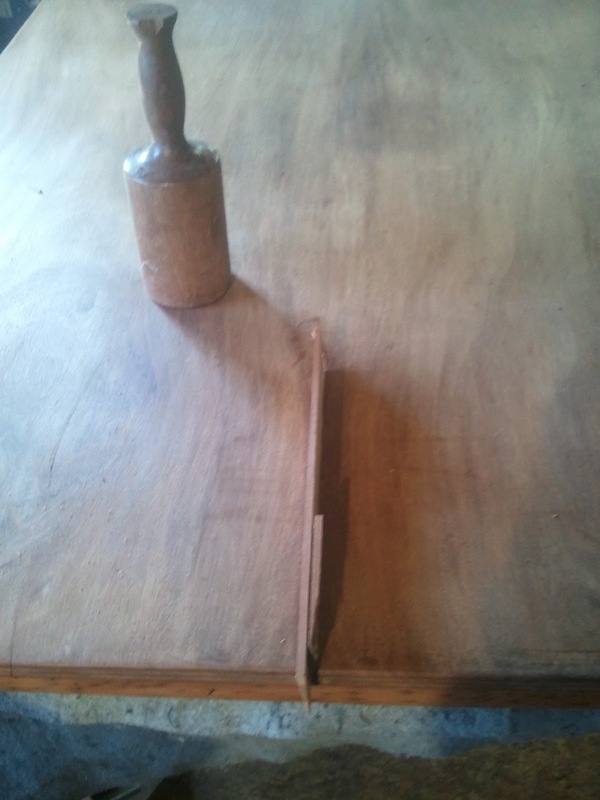 Once the patches were glued, a wedge was tapped into the top surface of the table. After the glue had set, the excess portions of the wedge was pared flush with the top surface, effectively filling the crack in the top. 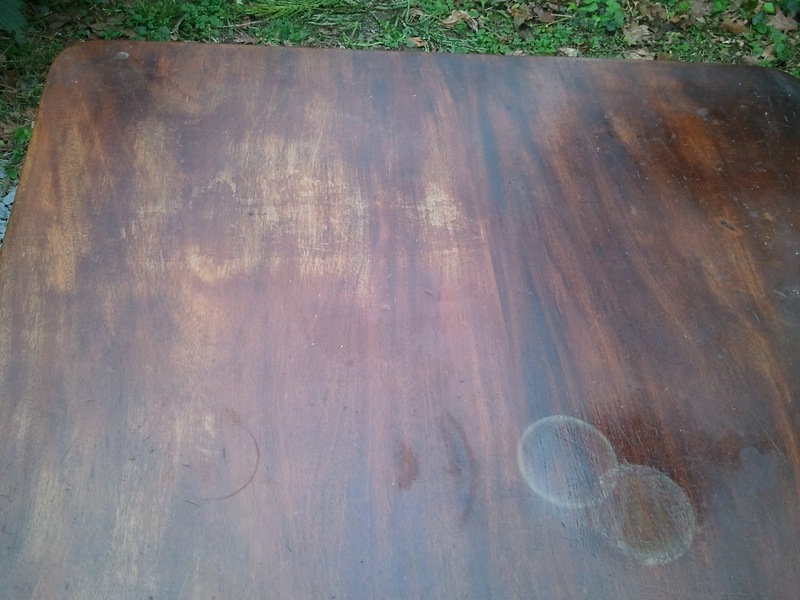 Once the repairs were made, the entire table was sanded and stained. This next photo shows the top after sanding. 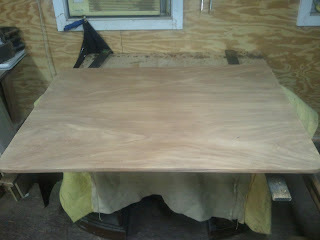 Below that is the base of the table during the finishing process. These last photos show the restored breakfast table from several angles and with the top up and down. 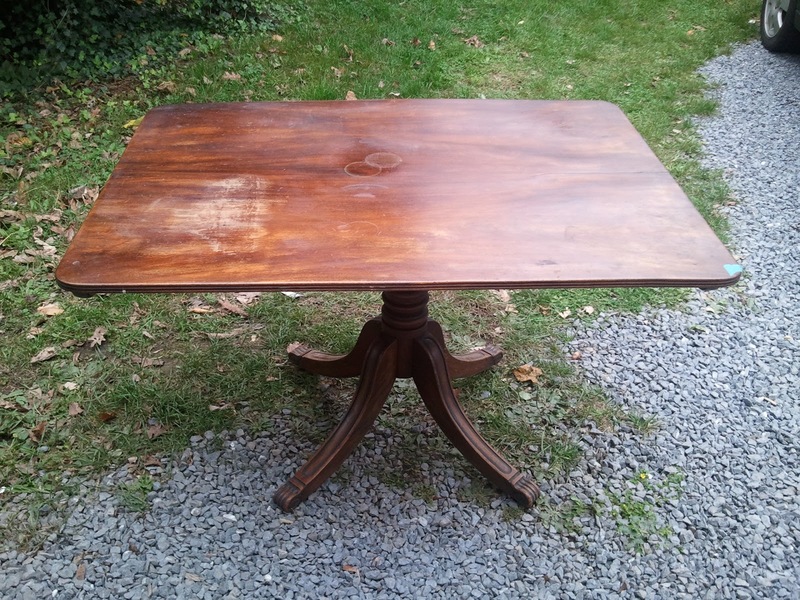 Shortly Before Thanksgiving, I completed the restoration of several pieces for a historic home in Jefferson County, West Virginia called Cedar Lawn. All post that I write concerning the furniture restored for this estate will have "Cedar Lawn" written in the title. 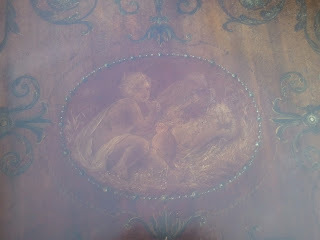 Cedar Lawn was built in 1825 for John Thornton Augustine Washington, the grand nephew of George Washington. 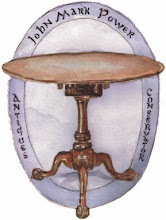 Here are two links to Wikipedia, one about Cedar Lawn and the other about John Washington. 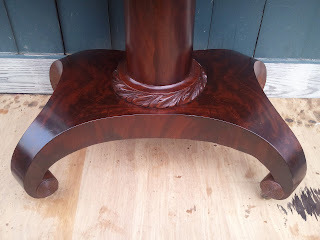 I will be writing several posts about the fantastic furniture that I had the pleassure of working on. 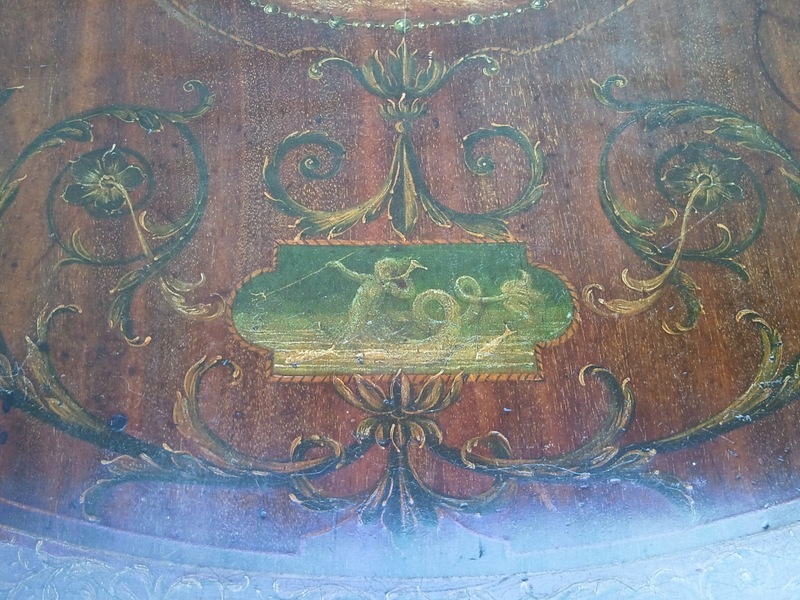 While the provenance of the pieces is hard to trace and none can be proven to be original to the estate, many of the pieces dated to the general time period of the house's construction and were in keeping with the architectural style of the house. 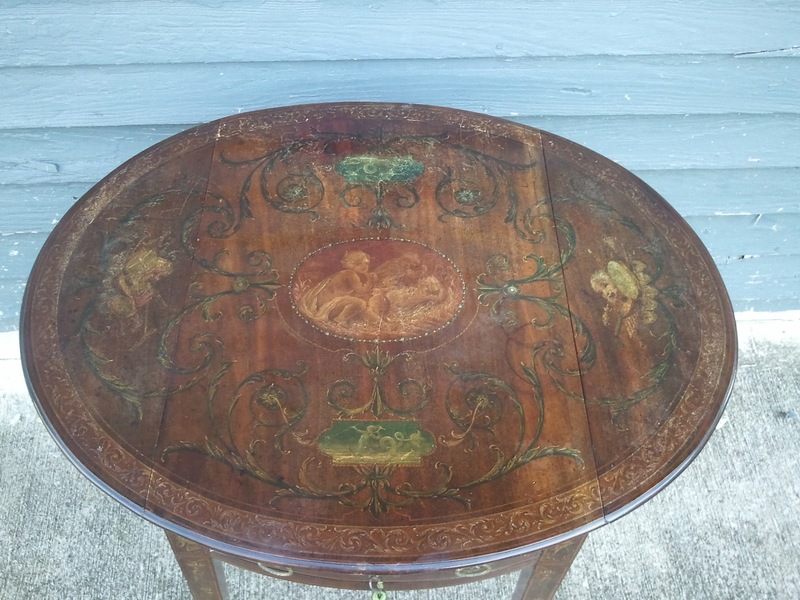 the first piece I will be writing about is a Late Classical, or American Empire game table. 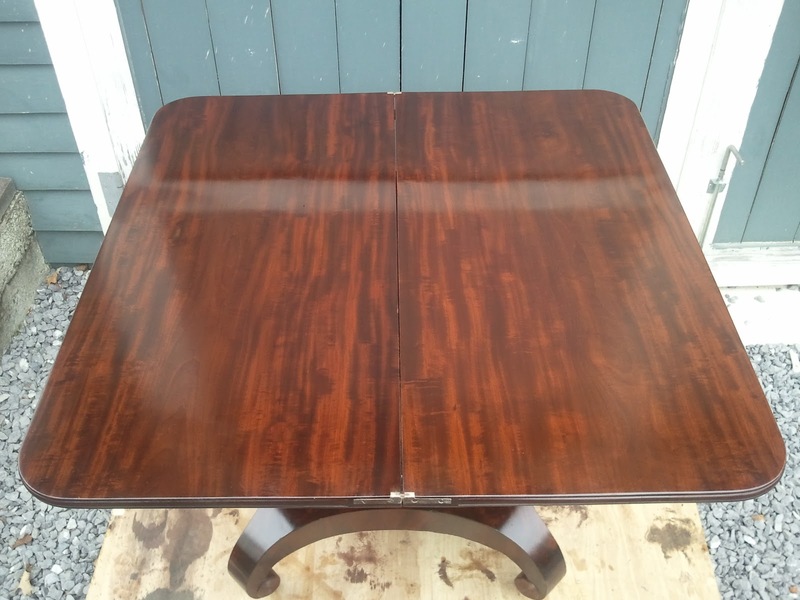 I have to say that in all of my time working on furniture that this style of game table is the most appealing to me and of all of the Late Classical game tables that I have worked on, that this is one of the nicest examples. 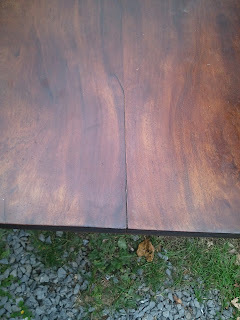 The table had lots of loose veneer and a broken foot. It also had a lot of separation on the finish so I decided to remove the finish, make the repairs, and refinish the table with a French Polish. 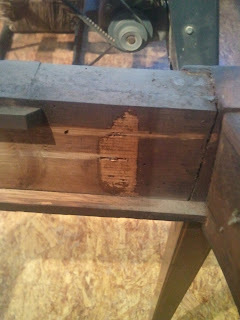 These first few photos show the table in the condition that it came to my shop. 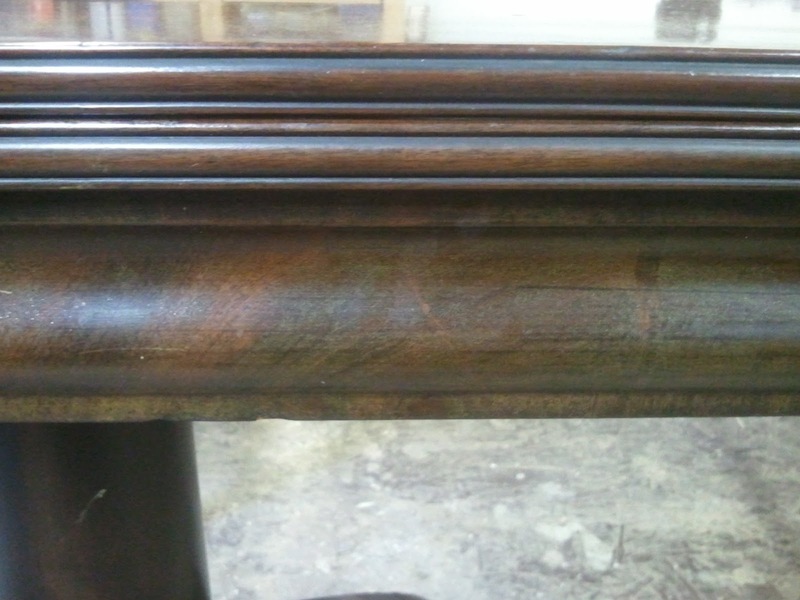 The close up photos show some of the separation of the old finish. 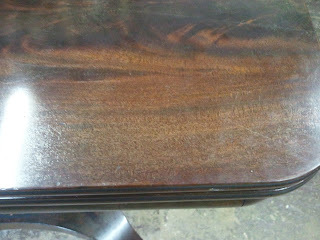 This photo shows some of the veneer loss on the base. 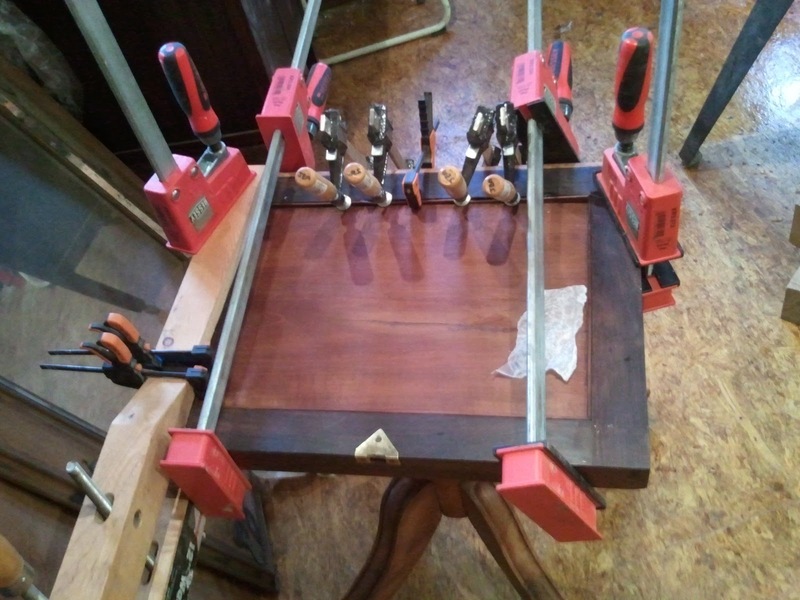 After the finish was removed, I set about repairing the table. A large section of the apron was loose and needed to be glued in place. 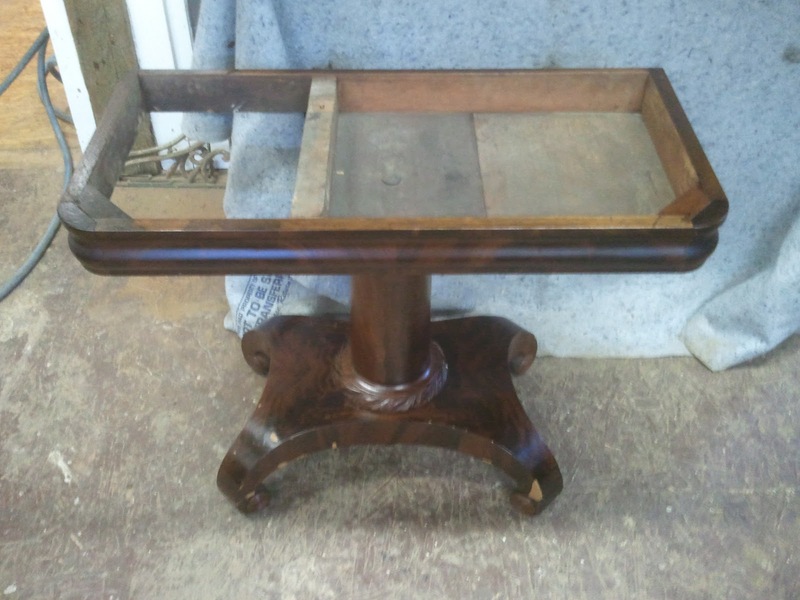 Some additional damage was that one of the tables feet had broken off of the table and had been poorly repaired in the past. These photos show the old repair undone and the foot separated from the base. In this next photo, The apron is being glued back in place. The next two photos show some creative clamping on the foot to glue it back in place. After those repairs were made, loose veneer and patches were glued in place as seen in the photo below. 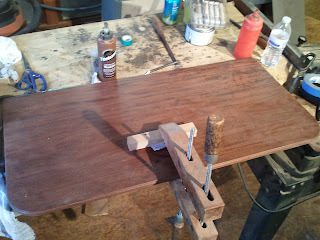 There was one veneer bubble that needed to be glued down on the top. 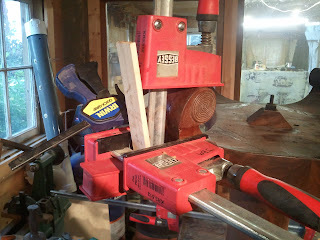 This photo shows that work being done. 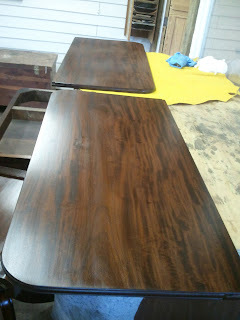 The next two photos show the tops and base during the refinishing process. 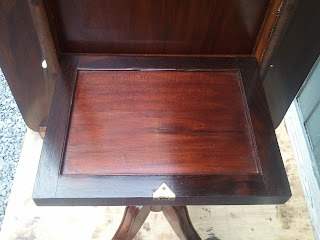 The following series of photos shows the restoration completed. 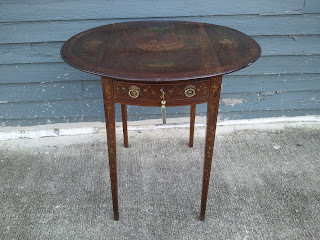 The photos show the top open and closed and also the table from a few different angles. The table had a bit of a mystery attached to it which I was unable to solve. One of the reasons that I was hired to work on this table was that on one side of the top, a 7/8" board which was added to the top surface had become separated along the joint. 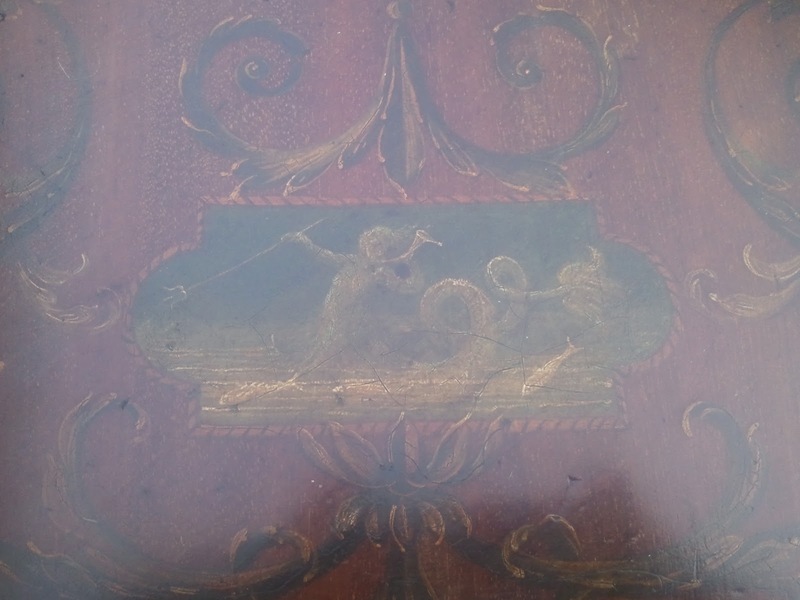 This piece had all of the indcations that it was original, including the fact that the painted decoration spanned the larger board on the top as well as this small board that was added on. When I removed the top The number 16 1/4 was written in chalk on the underside of the top. This number was the measurement of the width of the larger board that made up the top. Was this smaller board added later? If so, this meant that the painted decoration was also added later. Another clue was the fact that mortices with screw holes were cut into the original board. These hinge mortices were then cut into the added piece as well, as if the top had originally been smaller and the hinges were moved out to accomodate the added board. 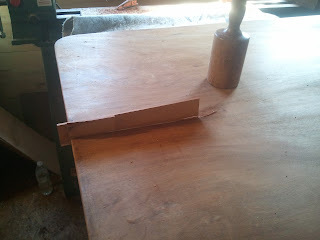 Perhaps the rule joint on the original top had been damaged and planed off to accomodate this new board early on. The only problem with this theory is that the number 16 1/4 is the measurement from the edge of the existing rule joint to the edge of the wide board. If there had originally been another rule joint there the board would have been wider. 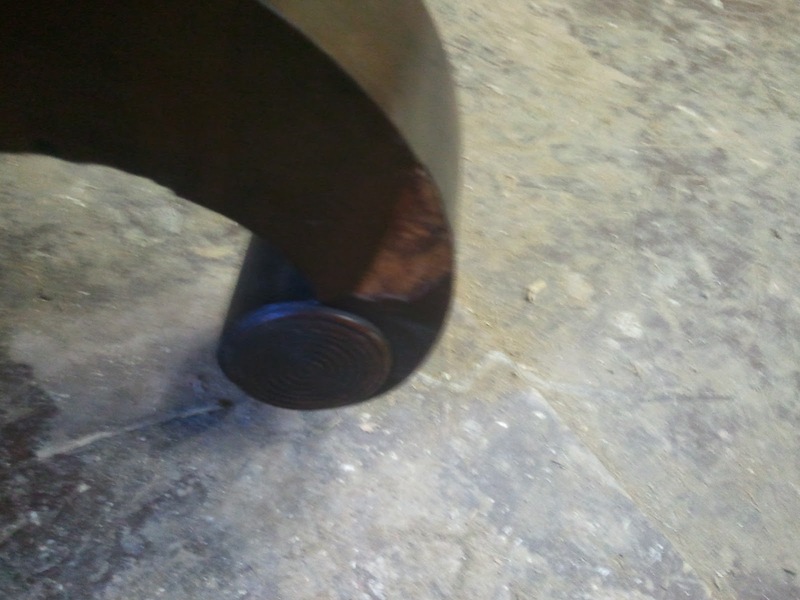 Another interesting piece was that both rule joints were scribed on the under side to mark a line to center the barrel of the hinge on. 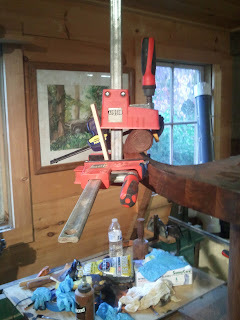 The placement of the hinge in a rule joint is critical to the action of that joint. 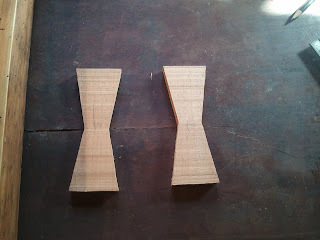 The scribe lines were identical and apperared to me to be done by the same hand. 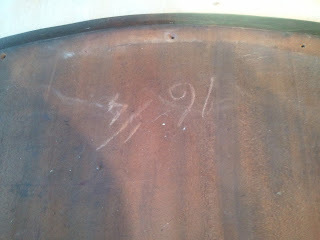 My best guess is that the added board was original. 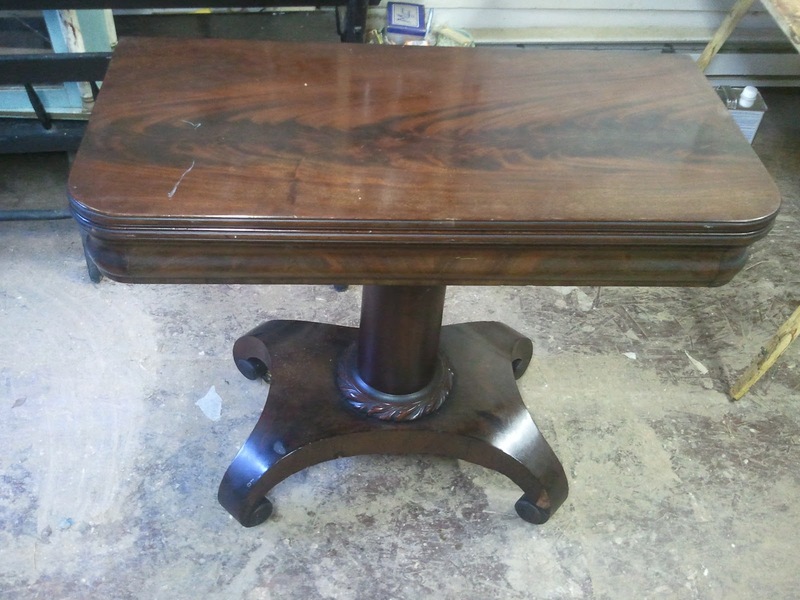 Perhaps the craftsman who made this table wanted to use the board even though it did not span the width of the base. Perhaps two people were involved and the measurements were mixed up. 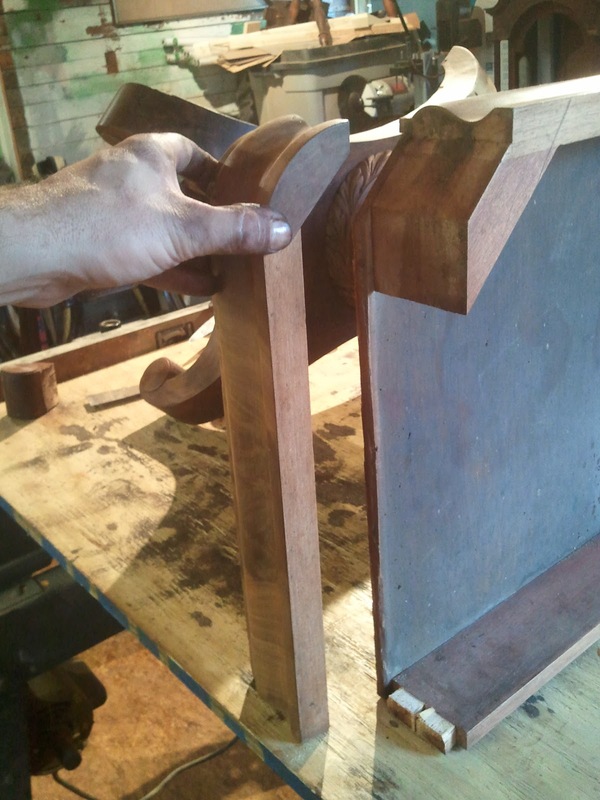 This would explain the original hinge mortices, except for the fact that when you make a rule joint, you cut the joint first and then attach the hinges! 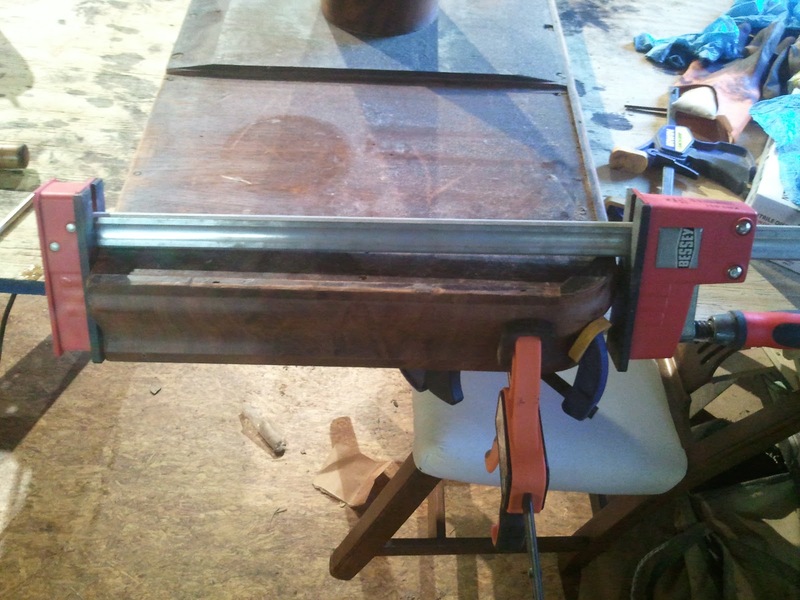 Creating the hinge mortices first wouldn't make any sense. 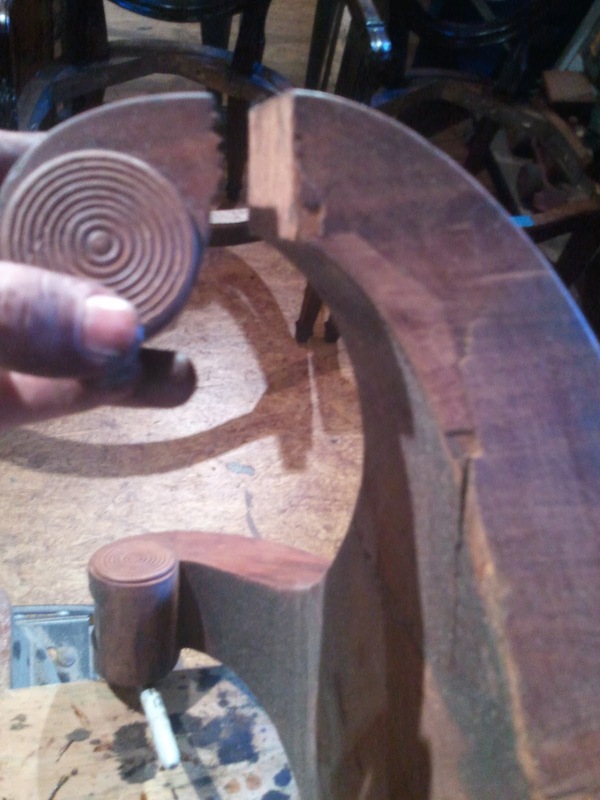 I am going to stick with the theory that the added piece is original, even though I cannot expain the hinge mortices. 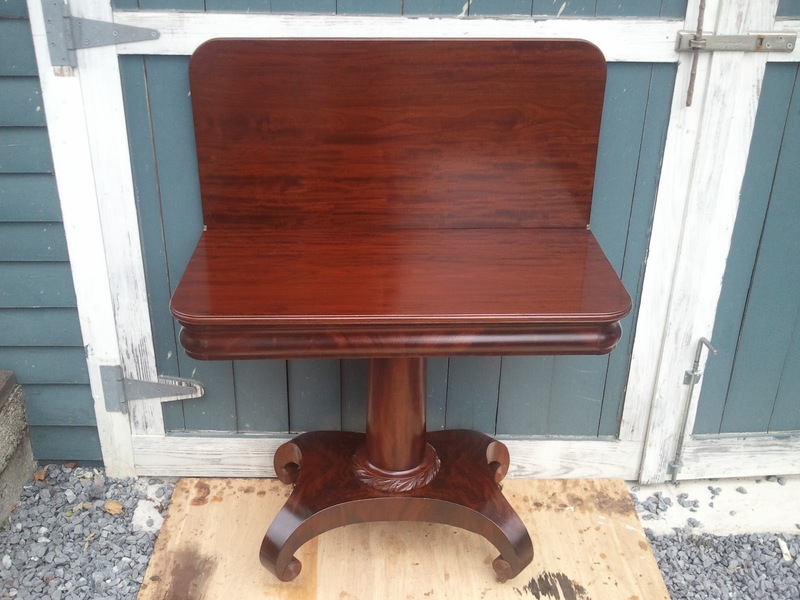 It is easy to believe that the craftsman, knowing the table would ultimately be painted,would join this extra piece on thinking that the decoration would draw the eye away from the joint and the solid mahogany color for the ground was all that the buyer would see. 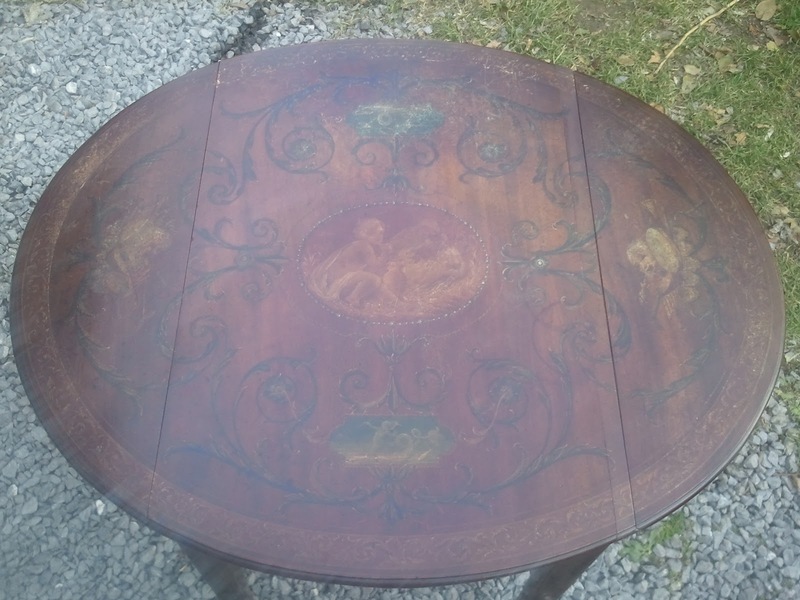 As I said, it was a real mystery to me and it seemed that the closer I examined the table, the more questions were raised. 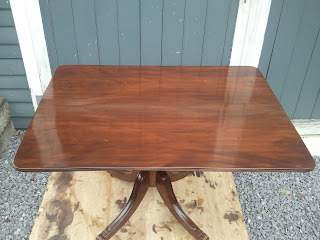 Below are a few photos of the table before, during, and after the repairs were made. No restoration was done to the finish except to wax the table. This was due to the original condition of the piece. 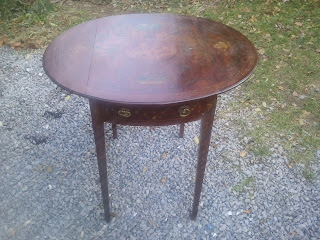 These first few photos show the table as it came to me. The light reflected on the top but you can see some of the painted decoration. 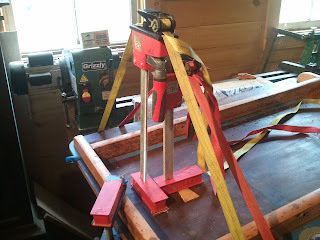 This photo, taken of the underside of the top, shows the 16 1/4" measurement referenced above. 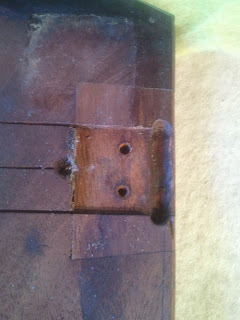 Here is a photo of an olde repair to one of the hinge mortices. 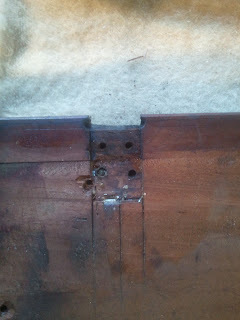 This photo shows how the hinge mortices on the side where the strip was added were moved out and new holes were drilled. 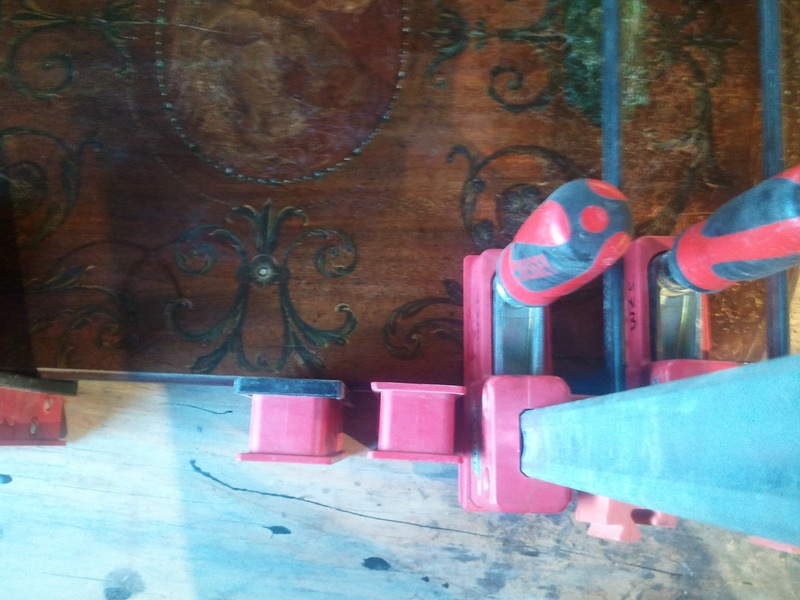 In this photo, you can see some damage to the stretcher above the drawer. 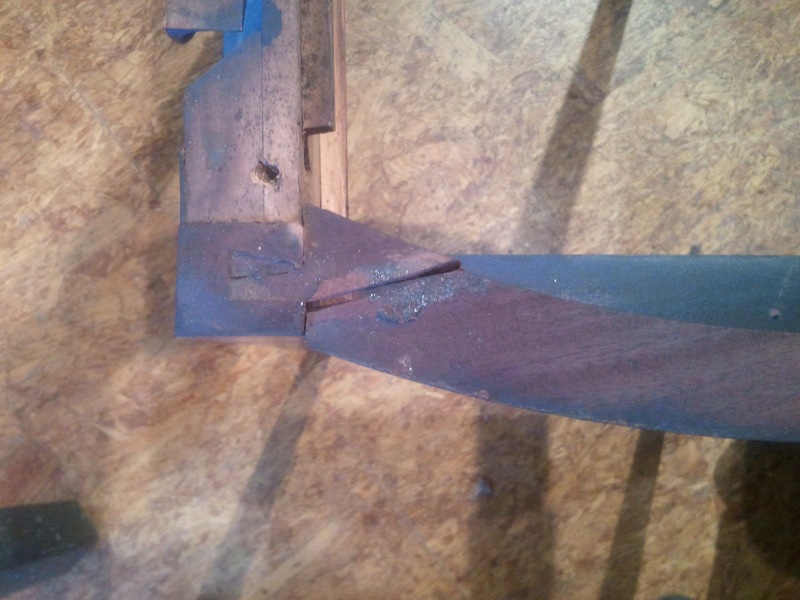 This was later repaired. The next two photos show the top being glued. 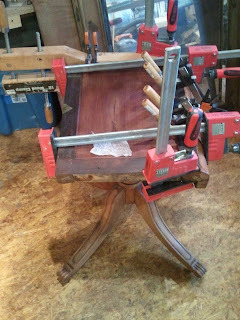 It is difficult to see, but in this photo I am lifting a loose section of veneer on the apron of the base. 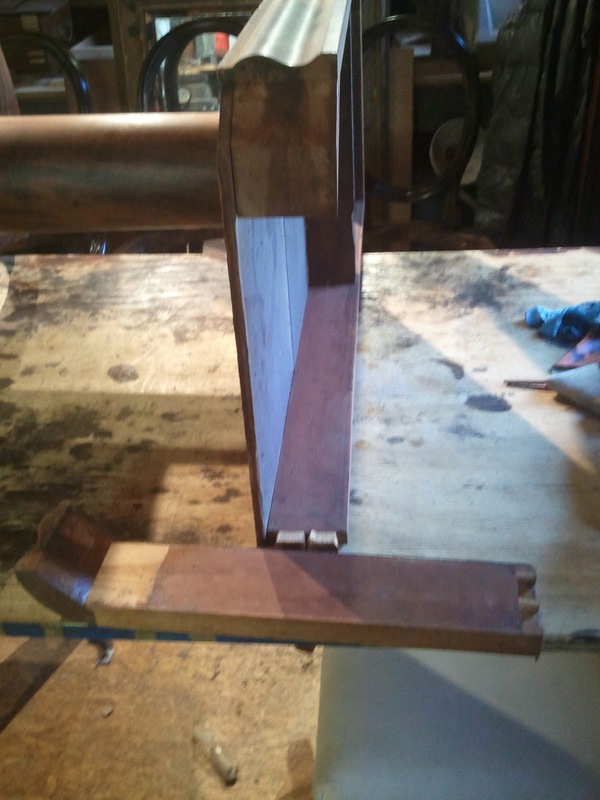 the following photo shows the same veneer without being lifted. 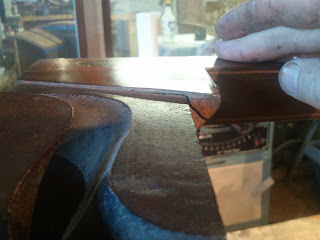 The glue beneath the veneer was cleaned and the piece was glued in place. 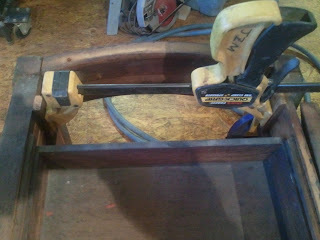 The stop blocks for the drawer were missing, causing the drawer to slide into the case. 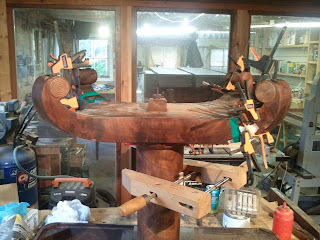 I added new blocks using old oxidized pine in the dimensions and location of the originals. The first photo shows the glue imprint of the original block and the second shows the new blocks being glued in place. These last few photos show the table after the repairs were made, the finish was waxed, and a key was made to work the lock. This is an exceptional table and was a lot of fun to work on!